A 7-night exploration of Mana Pools – a canoeing and walking safari with top professional guides, outstanding wildlife and authentic camps. 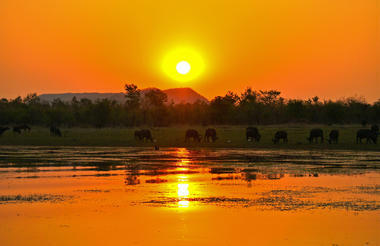 The 7-night Mana Pools Explorer safari is a canoeing and walking adventure. 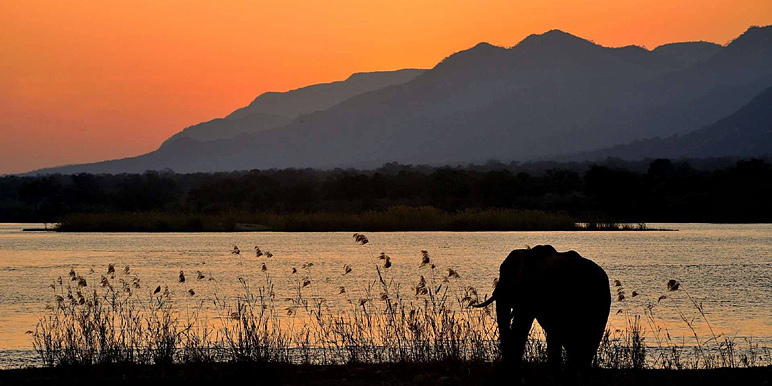 You’ll paddle the Zambezi River for 3 days, and explore Mana Pools for 3 days. 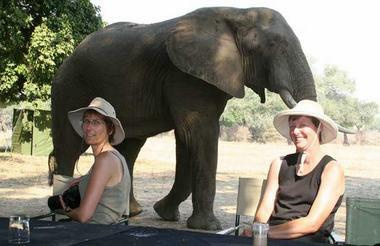 On the trip you’ll meet top professional guides and stay in authentic camps. 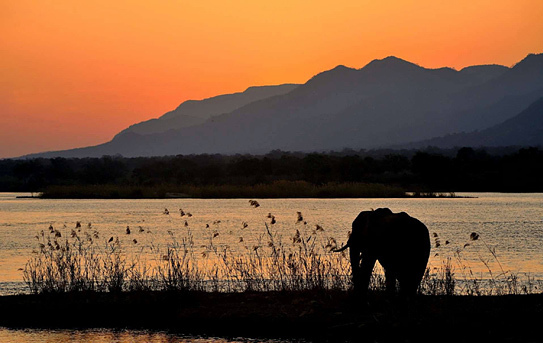 Spotting wildlife in this area is generally rewarding, especially within the Mana Pools National Park. Start off in a homely lodge overlooking beautiful Lake Kariba. This is an ideal position for a spectacular Kariba sunset. You’ll descend the Zambezi Escarpment to the lower stretches of the river the next day. The canoe section is 75km (46 miles) and departs on Sunday, Monday or Wednesday’s. You don’t need any previous experience to paddle the river. 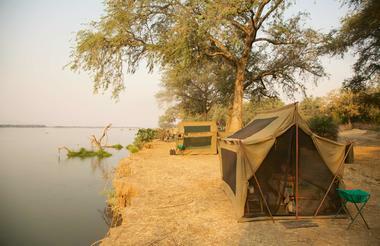 At the end point, exit the river and explore Mana Pools National Park from a fixed base camp for the next three days. Game viewing activities will be on foot and by vehicle. The canoe section is a semi-participatory trip, which means that everyone mucks in to help set up the fly-camp each night. Camps are simple as you’ll be carrying everything with you in your two man Canadian canoes. Sit back and relax on reaching Camp Zambezi at the end of the canoe trail. This is a larger tented camp with a full complement of staff. Joy of joy’s after three nights on the river, is the hot bucket shower in the evenings. Dinner is served under the stars with a glass of wine. September and October are best for concentrations of game. It’s jolly hot just before the rains which usually arrive from mid- November. 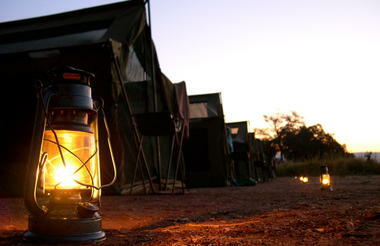 This is a world of lively campfires and night time stories, hurricane lanterns and bucket showers. Experience the real wilderness with essential camp comforts and fresh meals. We've been running canoe safaris for over 21 years and our experience speaks volumes. Our trips are generally leisurely. We camp under the stars on an island, or the river shore. We use very experienced canoe guides to get you safely down one of the most exciting rivers in Africa, the Zambezi River! Sturdy Canadian canoes carry two people, camping kit and luggage. The trail criss crosses back and forth between hippo pods. Wildlife drinks from the river off the sandy bank's as we move steadily along in the current. The camps are authentic, with the smell of wood smoke, and basic amenities that as as far away from the glitz and glamour of the modern world as you can get. 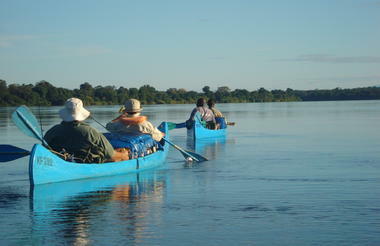 Our canoeing adventures are one of the most talked about and well remembered of all our Zambezi safaris. Mana Pools Explorer trip will start with an overnight stay in Hornbill Lodge. Safety briefings for preparation of the canoes on the river and procedures for camping. 7.30 pick up from your hotel and transfer to Chirundu for the start of your canoe adventure. Paddle to Kakomarara Island to spend the night. You will enjoy your first encounters with wildlife. Up at sunrise for tea/coffee/biscuits. 2 hours paddling until breakfast stop. Canoe until noon, lunch and siesta. Canoe until 5, set up camp on Lone Acacia Island. The day takes follows the same pattern as day 3. Regular stops for drinks/paddle breaks. Stopping on Trichelia Island for the night. A leisurely start before canoeing for 2 hours to meet transfer vehicle, drive to Camp Zambezi, your base for 3 nights. Relax and enjoy game watching, birding and botany with your Professional Guide. Road transfer from Mana Pools to Kariba Airport. From here, you will connect to your ongoing flights. There are two canoeing seasons – green season and high season. No single supplement applies unless clients request a private safari. Price Includes: Road transfers from and to Kariba Town. All meals. Drinks include mineral water, cordials, tea, coffee and imported wine with dinner. Use of` camping and canoe equipment. Services of a qualified canoe guide. CHILD POLICY: As a general rule we do not recommend children under 14 years of age on canoe safaris for safety reasons. • No children under 15 years of age will be accepted with mixed groups. • 15 years of age and above full adult rate. Note: Your luggage for the safari should not exceed 10 kilos per person. We recommend using a soft duffel bag and not a suitcase. All produce is brought in fresh and meals are prepared in camp by one of our famed bush cooks. All breads and pastries are freshly baked on the open campfire. Vegetarian or other dietary preferences can be catered for. Breakfast may consist of cereals, yoghurt, muffins, biscuits, pancakes, toast and jams. On the last day of safari, a full English breakfast will be laid on for clients to enjoy. Lunch is usually fresh quiche, lasagne or similar with a varied selection freshly baked bread, salads and cheeses. Dinners are full 3-course meals with various starters, delicious main courses and sumptuous deserts all eaten by candlelight under the stars, accompanied by an imported bottle of wine. We supply local beers, spirits, imported wines, minerals, cordials, mineral water, tea and coffee. Drinks are served by our friendly camp staff whilst guests relax. The canoes are two-man Canadian-style canoes, and the paddles are American Carlisle paddles. Two-man dome tents, sleeping bags, liners, mattress, flysheet. This is a static camp (mobile camp that does not move) offering rustic luxury set up on the bank of the mighty Zambezi River. Guests can experience the full range of safari activities including game drives, canoeing and walking. With no set itinerary each trip can be customized to the expectations of each individual group. The camp is perfect place to relax after finishing your canoe Safari. This safari starts and ends in Kariba. All transfers are in open 4 x 4 vehicles and take between 3 to 4 hours. Please be advised that roads can be dusty and bumpy. Charter flights to avoid the road transfer, are available at an extra cost. International inbound and outbound flights are excluded. Our team can advise or take care of these arrangements on request. Wildlife is abundant in the valley especially from June through to late October. The Zambezi runs through the Urungwe Safari Area, Mana Pools National Park, Sapi Safari, Chewore Safari and Dande Safari Areas respectively. Game is seen on every trip, most commonly impala, waterbuck, hippo, crocodiles, elephant and buffalo. Animals such as lion and leopard are more difficult to find but are certainly present. Wildlife is more abundant in Mana Pools, especially during the height of the dry season (July to October) when the game viewing can be fantastic. Games drives are in open 4×4 Toyota Land Cruisers. These drives may take you away from the river, to investigate the diverse inland habitats and occupants that make up the ecology of the area. Walking to explore and learn about the area, with your professional guide it is the best way to experience Mana Pools. The guide carries a weapon at all times. Mana can provide some amazing experiences, if guests are looking for close encounters with game. It is famous for its bull elephants and an encounter one of these gentle giants is an experience never to forget! "Zimbabwe – September We had a fabulous time in Zimbabwe. Ruckomechi has a great position on the river although not being actually in Mana Pools The variety on offer at"
"Mana Pools – May It was a fantastic experience and exceeded all our expectations. Our guide Bono Lunga was superb and he and his team made the safari very special. " "Fantastic trip to Zimbabwe – by Amy and Oliver We had a fantastic trip to Zimbabwe and would very much like to thank you and your colleagues for your assistance"
"Zimbabwe-October We all had a wonderful time and thank you so much for your expert organization – everything worked like clock work and we were all impressed by Zimbabwe.  Can’t"
"Kariba Canoe Safari Zimbabwe Hwange Cape Town in February We had and absolute fabulous time… So glad you were there to help us with the up’s and down’s Thanks again"
"Look no further! Our experience with the Zambezi Safari and Travel Company was faultless: We were particularly impressed with their detailed knowledge of the country and their attention to detail"
"Zimbabwe-June: Hello Liz, We had a wonderful and memorable trip to Zimbabwe. Your arrangements were impeccable and everything went off like clockwork. As you know this is our 2nd trip"
"Zimbabwe – September We have been pining away for Zimbabwe since we arrived back in the United States. First and foremost, I want to thank you for suggesting and putting"
"Victoria Falls in December: We returned last week from a trip that left us with many stunning experiences and impressions. 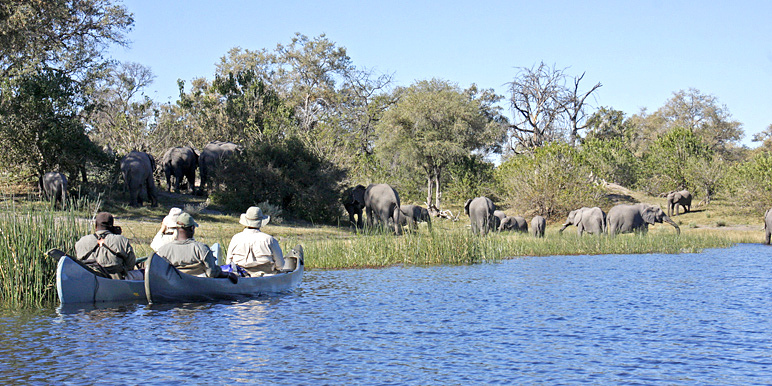 When it comes to the lion encounter and elephant safari,"
"Canoeing the Lower Zambezi River was mind-blowing! Dear Liz, Yesterday I arrived back home in Germany, but in my mind and in my heart I am still in Africa. It"
Lush and green… the sheer excitement of the arrival of life-giving water is infectious!